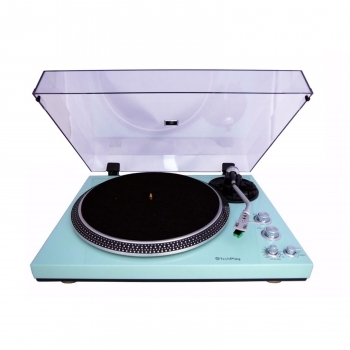 This high quality 2 speed turntable, not only looks great, but sound great as well. With slick body design, high gloss piano finish and silver and chrome color accents, an eye catching addition to your selection. Premium cartridge, Audio Technica AT95E on board for great sound quality. Aluminum cast platter insures a smooth rotation. 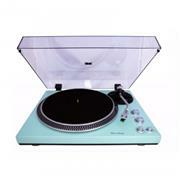 Auto stop and auto return professional S shaped metal Tone-arm for easy use. Built-In pre-amp will allow you to connect the unit to any powered (Active) speaker system, or amplifier. For serious sound enthusiast, Pre-amp by pass, is provided to connect to your professional system. Connects directly to PC to transfer your vinyl to digital file. Software and USB cord is included.